Firstly, the best way to rank on the Search Engine Results Pages (SERPs) in Google for more keywords, is to choose the right topic! Obviously certain topics will have a larger search demand and a greater number of relevant search queries, compared to others that simply aren’t popular enough to provide you with volume of keyword searches. A single webpage can actually rank for hundreds, or even thousands, of relevant associated keywords. Looking at huge aggregated data sets from AHREFS, a popular Enterprise SEO tool which we use at Toby Creative as part of our SEO tool-set, has recent research which has shown that the average number one ranking page will also rank in the top-ten for nearly one-thousand other relevant keywords. When planning the content for your webpage, and we are researching potential keyword traffic volume, we don’t just look at the search volume of the primary keyword you are wishing to target, but also review the top-ranking pages for that selected keyword to see how many other keywords they also rank for and what volume of search traffic it brings to these pages. When you perform this action, you realise that through this SEO strategy you will achieve around a hundred highly targeted visitors per month from ranking anywhere in the top-five grouping for this keyword. 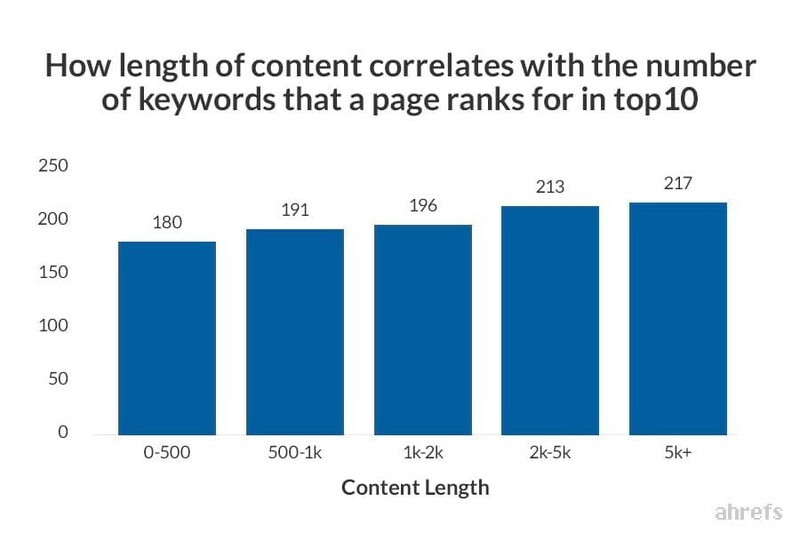 Not surprisingly, the longer form content that is used on your website, it is more likely to rank for more keywords, equalling more traffic to your website through this single page. Commonly many websites still have short form content of around only 300-500 word length, in 2017 we would like to see longer content lengths on the web pages, particularly blog posts and news articles to mix up the page length with word count variations of 1500, 2000 and 2500-word lengths. In our own SEO activities for clients we like to make good use of well-formed LSI (Latent Symantec Indexing) SEO keyword strategy which uses a mathematical method to determine the relationship between keyword terms and concept themes in the page content. The content of a webpage is crawled by a search engine bot and the most common keywords and keyword phrases are collated to identify patterns in the relationships between the keywords for that specific page. As part of your website content writing, consider natural search query phrases that your consumers would enter in Google’s search query, along with what spoken voice search queries they may use on their mobile phones. Due to the spoken word, understand and allow for similar sounding words, along with nuisances in how spoken voice inflections could form certain words and queries. Have you also identified and determined your ideal customer persona? Gender, age, cultural ethnicity, education and many other demographic variables may influence both how and what you write as part of your content, as well as the use of supporting images, along with profiling the types of queries and language which your target customer would most likely use. To further improve upon how many keywords can be ranked for a single webpage, we also look at the correlation between backlink factors for the page, as this significantly affects Google rankings, and should be part of the link building strategy directed towards the specific page focused around anchor text matching the variety of identified keyword phrases on the page. We will expect that pages with stronger backlink profiles will perform better for ranking keywords. The key to ranking for a large number of keywords is all about selecting a popular topic, which people would search for with the same words but different variations in search query phrases – as opposed to targeting multiple different non-related topics within the one page. So stay focused to the page’s theme! Longer format website content – blog post content – provides opportunities to fully explore a topic and enhance the information written around that topic. This naturally creates keyword rich content around the theme. Reference sources like dictionaries and the thesaurus to provide language ideas and research the value of what to use by comparing data trends obtainable from Google Trends and the Keyword Planner Tool in Google Adwords to determine which keywords are of benefit and will support the themed approach. Have you planned for the Facebook profile picture change?